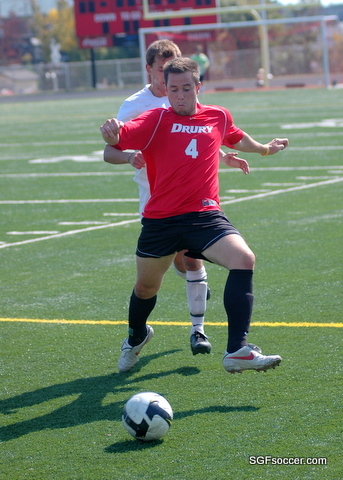 A nice story on Glendale Falcons and Drury Panther’s alum Danny Collins who is completing his studies at Drury this Summer. He’s receiving his Masters in Architecture this month and an MBA in August. He is a senior at Drury graduating with a master’s degree in architecture in May and a master’s degree in business administration in August. To his friends, Collins might be considered an overachiever. But to Collins, his success is merely about hard work. 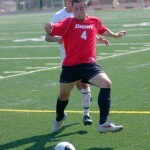 In addition to graduating with two master’s degrees, he starred on the Drury soccer team from 2007-2010. In October of his senior year, I talked to Danny along with his two teammates Adam Peterson and Alex Palmer (pictured on either side of him) about their experience playing for college soccer in their hometown (Peterson and Palmer are Kickapoo grads). I’ve included the video below. 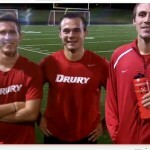 Senior Grant Bowden’s header goal (video below) in the 26th minute Sunday afternoon gave Drury all it needed to pull out a 1-0 Great Lakes Valley Conference soccer victory over Saint Joseph’s on Senior Day at Harrison Stadium in The Curry Family Sports Complex. Bowden’s second goal of the season helped the Panthers to improve to 10-6 overall and 9-5 in the GLVC as they secured their spot in the eight-team GLVC Tournament field which opens play on Oct. 31. Drury will be the No. 5 seed and visit No. 4 Quincy next Sunday at a time to be determined. Saint Joseph’s fell to 8-7-1 and 6-7-1. DU junior keeper Stephen Conner picked up his seventh shutout of the season and school-record 21st of his career for the Panthers. Drury outshot the visiting Pumas 14-4 on a day when the program recognized 12 seniors in post-game ceremonies for their contributions in their final home game of the season – Blake Wilson, Ben Taylor, Peter Higgins, Mason North, Danny Collins, Alex Palmer, Connor McClellan, Adam Peterson, Micah Whorton, Taylor Stacy, David Emnett and Bowden. The Panthers will close out the regular season with a non-conference match at Harding on Tuesday in Searcy, Ark. The Panthers travel to No. 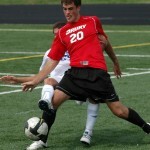 4 seed Quincy (10-4-2) for a first round GLVC Tourney game next Sunday. Drury (10-6-0) finished as the No. 5 seed. Four years of hard work on the pitch is coming to a conclusion for a trio of local boys. Adam Peterson (Kickapoo), Danny Collins (Glendale) and Alex Palmer (Kickapoo) are playing in their final two regular season home games this Friday and Sunday. Each of these young men excelled during high school and have become important contributors to a nationally recognized program at Drury. They share some thoughts on the highlights of the four years that have gone by quite a bit faster then they would have anticipated back in August 2007 when preseason training began. The team will reach the GLVC playoffs but a pair of wins this weekend could lead to a home game on Sunday October 31st. You can help these representatives of SGFsoccer.com achieve that goal by coming out for a game and lending your support to their efforts. See you there! Senior forward Micah Whorton scored three goals – setting a Drury career mark for points and moving closer to becoming its all-time goals leader – and the Panthers posted a 5-1 victory over Kentucky Wesleyan in Great Lakes Valley Conference men’s soccer Sunday afternoon at Harrison Stadium. Whorton scored twice in the first half and then added a third just two minutes into the second half before retiring for the day as the Panthers moved to 8-4-0 overall and 7-3-0 in the GLVC with their third straight victory. Whorton now has eight goals on the season and 33 for his career, moving past Jarrett Wagner (32 goals from 1993-96) into third place on the all-time DU charts. Whorton now trails only John Pedroli (37 from 1999-2002) and Steve Wilczewski (35 from 2006-09) in career goals at Drury. With six points on his three goals Sunday, Whorton also became DU’s career leader in points with 90, surpassing the previous mark of 85 set by Wilczewski last season. Whorton’s 2nd goal can be seen below, assist by freshman Mike Yuede. Whorton tallied first off an assist from senior Ben Taylor just seven minutes into the contest for a 1-0 Drury lead that grew to 3-0 by halftime on goals by Whorton at 23:35 (Michael Yuede assist) and senior David Emnett at 37:27 (Danny Collins assist). 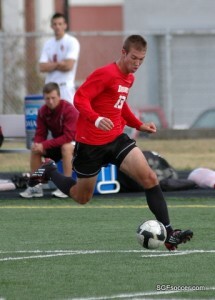 Whorton scored at 47:38 just after the half from five yards out on Yuede’s second assist of the day. Wesleyan (2-11, 0-11 in the GLVC) got on the board with a goal from Jordan Sosh against DU backup keeper Andrew Klump at 57:09 before Collins finished the scoring with a goal from eight yards out at 77:46 off an assist by freshman Matt Baker. The Panthers outshot Wesleyan 24-2 in the contest and a 13-0 advantage in corner kicks. Drury is on the GLVC road next weekend for matches Friday at Indianapolis and Sunday at Northern Kentucky, the latter pitting the top two teams in the league’s preseason poll. 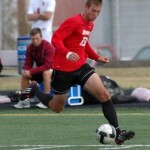 From DruryPanthers.com – Micah Whorton’s goal off a Peter Higgins assist with 6:34 left in the second overtime rallied Drury to a 3-2 victory over Rockhurst in a Great Lakes Valley Conference men’s soccer match Sunday afternoon at Harrison Stadium. 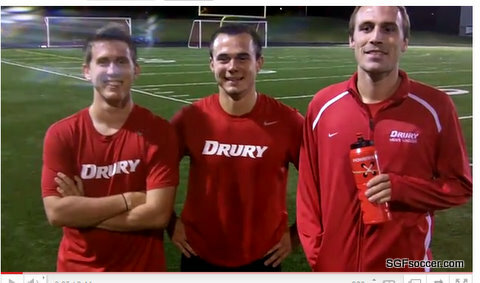 Whorton’s goal capped a furious comeback after Drury trailed 2-1 with just over 10 minutes left in regulation. But senior David Emnett scored from 15 yards out on an assist from freshman Matt Baker in the 79th minute with the goal that would force overtime. After a scoreless initial 10-minute extra period, Higgins worked his way toward the goal from the right side and fired a pass to Whorton, who put it home to touch off a DU celebration as the Panthers improved to 4-1 overall and 3-0 in the GLVC with their fourth straight victory. Senior Danny Collins got the Panthers on the board first wen he scored from three yards away in the 13th minute, off an assist from freshman Alec Nagel and senior Alex Palmer, for a 1-0 advantage before Rockhurst tied it on Curt McDonald’s goal in the 34th minute to send the teams to halftime knotted at 1-1. Paolo Scoppola scored an improbable goal from 20 yards out over the head of DU keeper Stephen Conner at 59:42 to give the Hawks (3-2, 2-2 in the GLVC) a 2-1 advantage before the Panthers rallied. Conner had five saves, matching Rockhurst keeper Kyle Clawson, as the Panthers outshot the visiting Hawks by a 13-9 count. 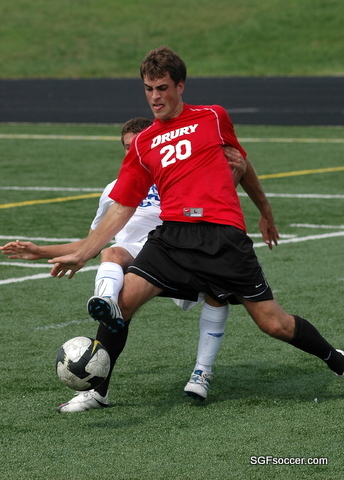 Drury returns to action on Tuesday, playing Quincy at 7 p.m. at Cosmo Park in Columbia in a makeup of their rained-out GLVC match in Quincy on September 10.